East Coast skiing is at its best in Stowe, Vermont. Skiers take to the slopes at Stowe Mountain Resort. Photo courtesy of Topnotch Resort. 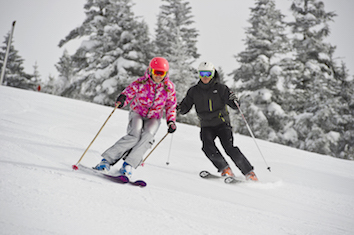 Having lived in Colorado for several years, and skiing much of the ski resorts in the West, I was thrilled at the opportunity to visit Stowe, Vermont, for a quick girl’s ski trip. This was my first time to Vermont, and I really wasn’t sure what to expect. Of course, I had heard about icy conditions on the East Coast and all that jazz, but I decided to remain open-minded about the experience. And, while I typically take these trips alone, I was stoked (gotta use the lingo) to have my friend Katie along for the ride. We met up at the Atlanta airport with just enough time to have a glass of wine before catching our flight to Burlington. Once we landed, it was a quick 45 minute ride into Stowe. 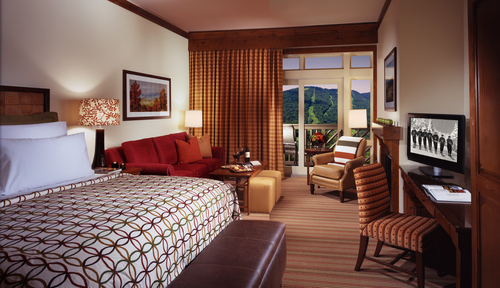 The rooms at Stowe Mountain Lodge exude a mountain chic ambience. 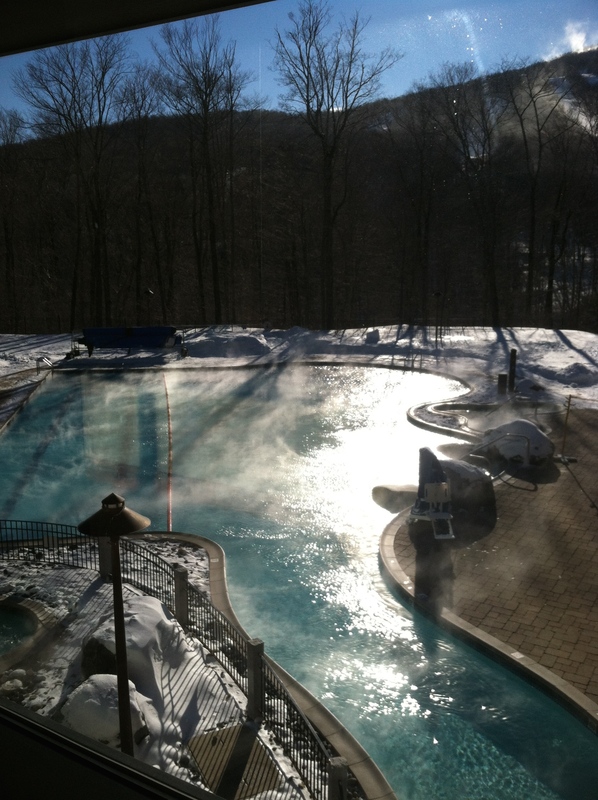 Photo courtesy of Stowe Mountain Lodge. Upon arrival at Stowe Mountain Lodge—the only ski-in/ski-out property at Stowe Mountain Resort—we checked into our room (one of 312 guest rooms at the property). The resort exudes rustic-chic mountain charm, and it stands as the centerpiece of Spruce Peak at Stowe (a $400-million alpine village project currently in the works that will include an indoor climbing wall, new restaurants and shops, a movie theater, and ice-skating rink and a zip-line tour). 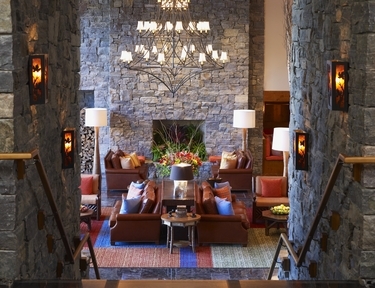 Cozy seating areas abound at Stowe Mountain Lodge. Photo courtesy of Stowe Mountain Lodge. Our first order of business was to grab a seat at the Hourglass bar, and, along the way, we couldn’t help but noticed the inviting seating nooks located throughout the lobby and bar area. We made a vow to drink hot cocoa either in one of these nooks or by the raging fireplace in the cozy lobby. After chatting it up with some of the locals over a bottle of wine, we decided to turn in early to prepare for a day of skiing. The next morning started off with some much-needed fuel at the lodge’s Solstice Restaurant. This AAA Four Diamond restaurant, headed up by Executive Chef Josh Berry, is known for its farm-to-table dishes that highlight local, natural and mostly organic ingredients. In addition to an open kitchen, the restaurant features a wall of windows with beautiful views of Spruce Peak mountain. I opted for the Vermont omelet while Katie chose the Eggs Benedict. Both featured farm-fresh eggs and Vermont ham, while my dish oozed with local cheddar and hers was dripping with tasty hollandaise sauce. Feeling quite satiated, we headed over to the Spruce Camp base area to get fitted for skis. 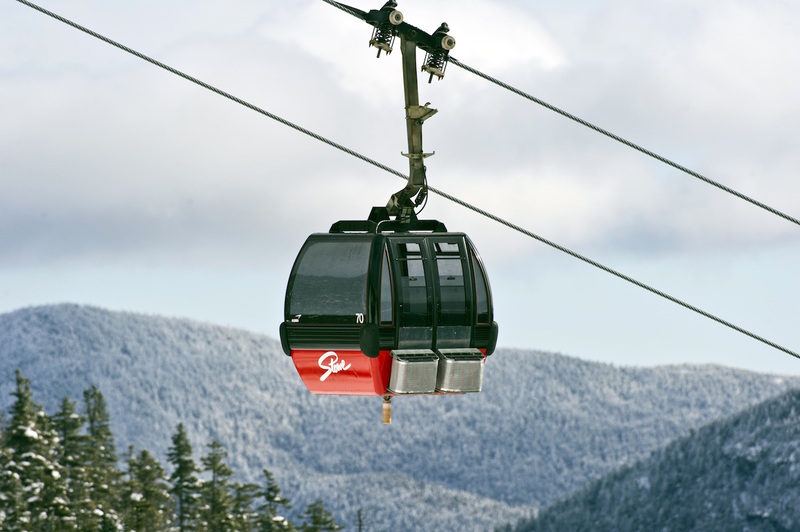 The gondolier at Stowe Mountain Resort Photo courtesy of Topnotch Resort. Here, we found a truly helpful and friendly staff that was eager to get us outfitted in top-of-the-line gear. And once we were looking the part, skis in hand, they also went so far as to give us tons of helpful tips on navigating Stowe Mountain Resort’s two mountains: Spruce Peak and Mt. Mansfield. While the “Front Four” trails (Goat, Starr, Liftline and National) are the most challenging at Stowe, we decided to try a blue run called Gondolier. Three runs down this bad boy (after having not skied for about a year), and my thighs were feeling the burn. But, I was so happy to know that I’ve still got it! Near-perfect snow and bluebird skies set the scene for a pretty perfect day. At this point though, we decided to call it a day on the hill. 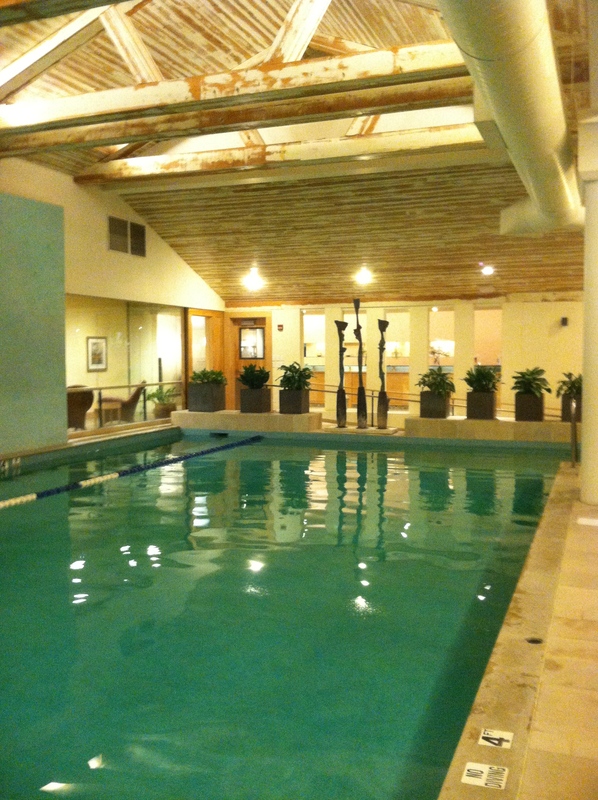 Next up was a trip to the Spa and Wellness Center at Stowe Mountain Lodge. The 21,000-square-foot spa features a fitness center (with gorgeous yoga studio), an outdoor swimming pool, Jacuzzis, a relaxation lounge, 18 private treatment rooms and the Healing Lodge. It was within the Healing Lodge that I found utter bliss. A hot/cold treatment here begins with a cold rain bath, followed by a soak in the hot tub, a Himalayan-salt scrub and a final cold rain bath. Talk about invigorating! I also couldn’t resist the sauna and steam room. As if this wasn’t enough, Katie and I both indulged in 80-minute massages (the perfect cure for sore leg muscles). Once we were all prettied up again, we headed to Solstice Restaurant for dinner. And this time, I had one of the top five meals of my life. We started with the carpaccio of beef (featuring bone marrow powder, caper berries, arugula and smoked Grafton cheddar). 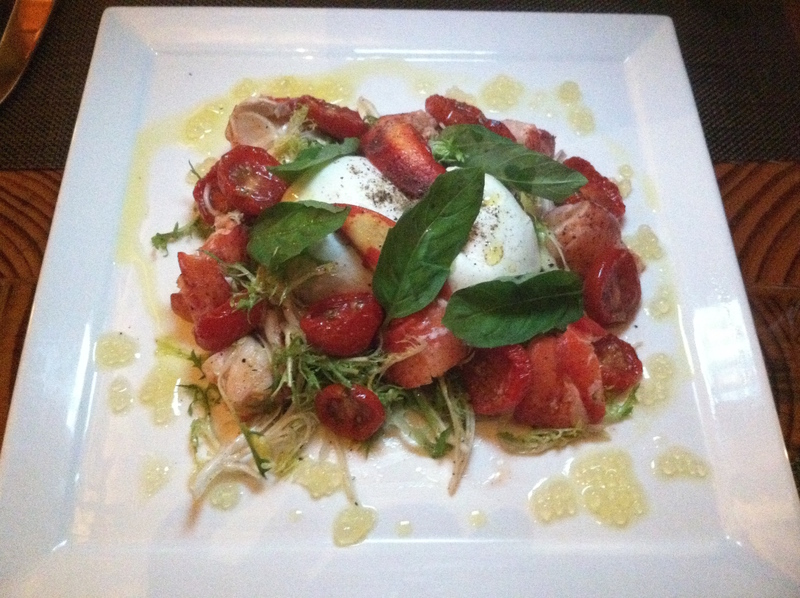 Next up was the lobster salad, with huge chunks of fresh lobster (flown in daily), local burrata, basil, olive oil, roast cherry tomatoes and lemon “pearls.” Katie and I couldn’t decide between the 8-ounce filet of beef tenderloin and the pan-roasted scallops, so we ordered one of each. Friends share, right? The filet simply melted in my mouth, and the succulent scallops shone with red curry, baby bok choy, puffed rice and lime. Katie and I after a day on the hill. After a day like this, we couldn’t believe we still had two days left in our trip. But, we were up for the challenge! We called it an early night and woke up early the next morning for another day of skiing. This time though, we decided to explore more of the mountain. We headed over to the far end of Mt. Mansfield for some easy greens through gorgeous forests. I have to admit, the Toll Road run was one of the best times I’ve had skiing. It was just nice to chill and take in the scenery. Skiing is definitely a time where I find my Zen. We also headed over the Spruce Peak side of the resort and tried the blue Ridge Run for a bit more of a challenge. For those really looking for a challenge, try the oldest ski trail on Mt. Mansfield (Bruce Trail). According to local snowboarding pioneer and Olympic gold medal-winning coach Bud Keene, this is Stowe’s best off-the-beaten path “secret” run. “It plunges over 2,000 vertical feet down the side of Mt. Mansfield,” he says. “Narrow throughout, and punctuated by steep double fall-line sections, it also leads directly to Stowe’s best aprés bar and restaurant, The Matterhorn.” We decided to skip Bruce Trail, but we kept The Matterhorn in mind for later. Topnotch Resort beckons with a modern design aesthetic. 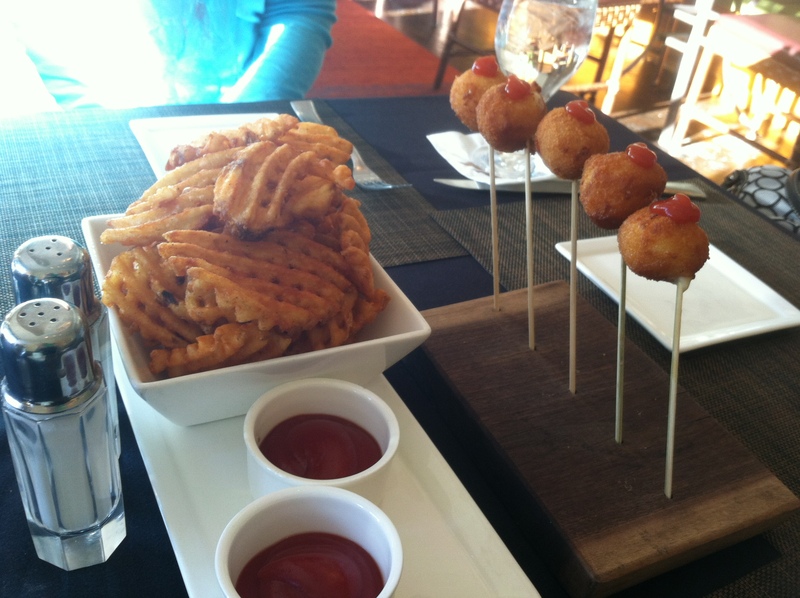 Photo courtesy of Topnotch Resort. While Katie and I did not want to leave the lodge (I had a plan in place to hide out in the spa), we packed up our bags and headed over to Topnotch Resort. 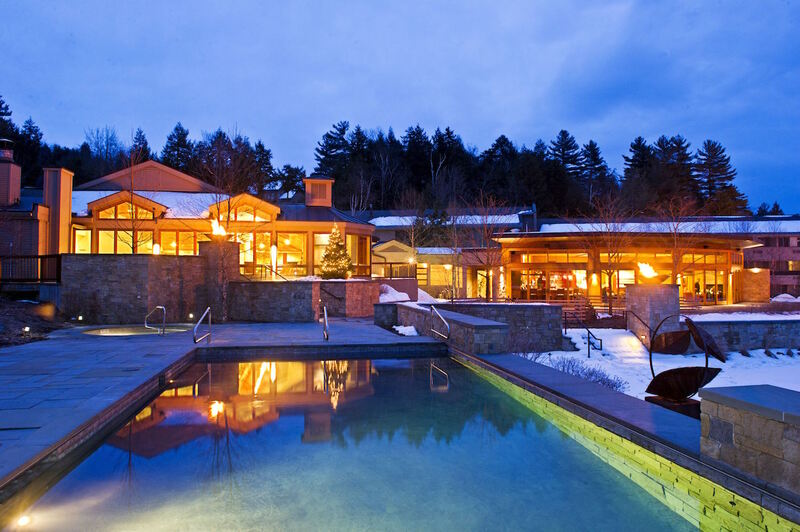 Located just a few miles down the road from Stowe Mountain Lodge, this resort features an entirely different vibe altogether. The resort underwent a major renovation in 2013 to its hotel and restaurants. With its modern design aesthetic and happening bar (known as The Roost, featuring a shuffleboard table and frequent live music), I knew we had found a cosmopolitan locale in the heart of the mountains. Topnotch Resort also lives up to its name with a 35,000-square-foot spa (featuring over 120 treatments, an outdoor pool, and a relaxing indoor pool and hot tub with waterfall), plus a salon and fitness center. After checking in, we decided to hit the town by trying The Matterhorn. We bellied up to the bar for pints of local beer and the two-for-three sushi special (buy two sushi items, and the third is free). The night we were there, we shot several games of pool with some locals. This is for sure the place to find great company, have a few drinks and talk about your day on the hill. And it’s easily accessible from both resorts. The next day was set aside for pure relaxation, which was a good thing after a night of drinking, so we decided to hit the spa. We lounged around for several hours, alternating dips in the hot tub and the pool. Once we felt completely revived, we dressed for dinner at Flannel (the resort’s in-house restaurant). Also featuring an open kitchen (headed up by Executive Chef Cortney Quinn), majestic views of the mountains and a philosophy of using only fresh, seasonal ingredients, this restaurant was also a true palate-pleaser. We started off with the Vermont cheese board (featuring a selection of five different cheeses, Butternut Mountain Farm honey and Jan’s Farmhouse crisps) and the lacquered pork belly (served with smoked butternut squash silk and spiced maple syrup). Next up was a shared chopped salad with romaine, pear, Vermont feta, cranberries, pecans and maple Dijon vinaigrette, followed by the main event of crispy duck breast for me (served with roasted sweet potato and macumber turnips, trumpet mushrooms and chipotle orange glaze). At this point, I think Katie had just about as much indulgence as she could take. We decided to forgo a game of shuffleboard in The Roost and decided instead to get a solid night’s rest prior to our early departure the next day. 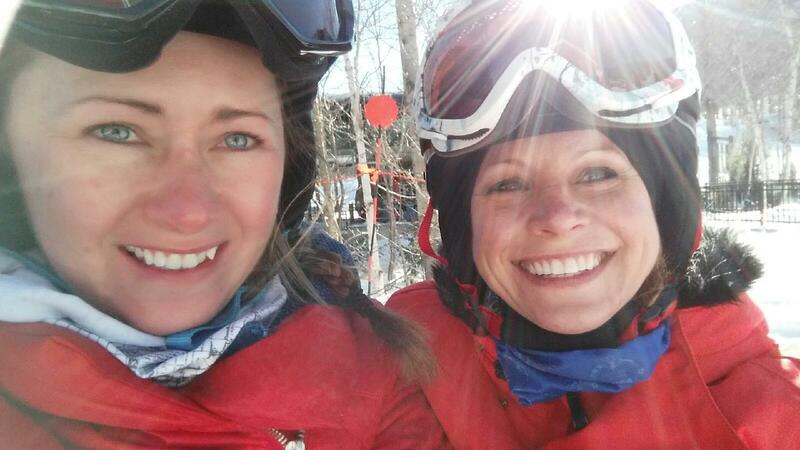 For two Colorado girls, Vermont certainly had its way with us. And we were lucky to enjoy so many pleasures in just a few short days. Until next winter! !